Originally from the suburbs of Detroit, Michigan, Michael Newman first worked in Los Angeles by developing an original concept for Lincoln’s “Rising Stars” film promotion, in which his original script was shot as a promotion for the new Lincoln MKS. 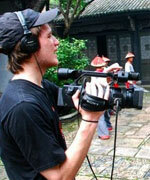 While still finishing up a degree in Communications and Media Studies at Wheaton College, Newman travelled across the world to Shanghai, China, to shoot and direct an ancient Chinese-themed short film for DIRECTV. Newman later enrolled in the MFA film production program at the University of Southern California, where he continued to produce award-winning work for brands such as Discover Card, Duncan Hines and Chevy. Newman also worked in the offices of Principato-Young Entertainment and on-set at the Sony Studios in Culver City. While finishing up his final year at USC, Newman continues working on a variety of projects in multiple capacities-currently producing the feature documentary “20 years of Madness”, editing a feature documentary on health & wellness and continuing to direct whenever the opportunity arises.